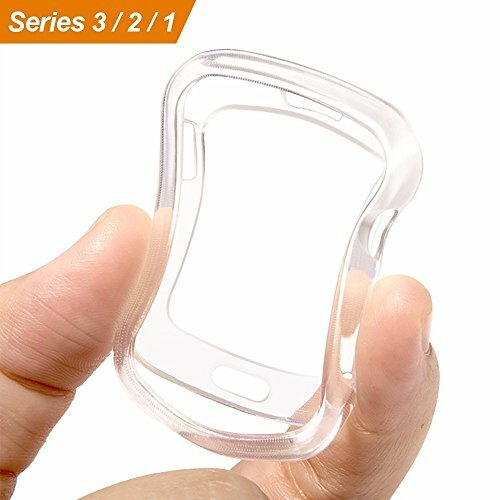 Home/Electronics/Wearable Technology/Accessories/Smart Watch Accessories/OULUOQI for Apple Watch Case 38mm, Clear Soft TPU Protector iWatch Case Cover for Apple Watch Series 3, Series 2, Series 1, Nike+, Sport, Edition. OULUOQI for Apple Watch Case 38mm, Clear Soft TPU Protector iWatch Case Cover for Apple Watch Series 3, Series 2, Series 1, Nike+, Sport, Edition. Warranty: For 18 months after the date of purchase, we take care of all quality-related issues with a REPLACEMENT or REFUND. Pls contact our OULUOQI support team. Charge directly, do not need to take the case off to charge. And you will not be worried about sweat buildup after a workout. Installation: When you install the Case , please put the watch into it from the front of Case, Also please make sure that the rotating button is on the correct side then press the watch into Case. Transparent case fit for all kinds of straps and match for various of colors, such as Sport Bands, Leather Bands, and so on Application: Perfectly fit for 38mm Apple watch Series 3,Series 2,Series 1, Sport, Edition..